MISSION ESL COMPUTER LAB: Isaac Stern, 1920 - 2001: One of the Most Honored Musicians in the World. 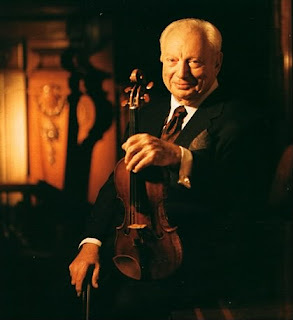 Isaac Stern, 1920 - 2001: One of the Most Honored Musicians in the World. And I’m Steve Ember with the VOA Special English program, PEOPLE IN AMERICA. Today we tell about one of the world’s greatest musicians, violinist Isaac Stern. Isaac Stern was more than a great violin player. He was one of the most honored musicians in the world. He was an international cultural ambassador. He was a major supporter of the arts in America and in other countries. He was a teacher and activist. For more than sixty years, Mister Stern performed excellent music. He performed in concerts around the world and on recordings. He played with major orchestras and in small groups. Here he plays Sergey Prokofiev’s Violin Concerto, Opus Nineteen, with the New York Philharmonic Orchestra. Isaac Stern was born in nineteen twenty in what is now Ukraine. His parents moved to San Francisco, California the following year. His mother began teaching Isaac the piano when he was six years old. He began taking violin lessons after hearing a friend play the instrument. Later, he began studying music at the San Francisco Conservatory. He progressed quickly. When he was sixteen, he played with the San Francisco Symphony Orchestra. The next year, he performed in New York City and was praised by music critics. During World War Two, Mister Stern played for thousands of American soldiers. It was the first time many of them had heard classical music. After the war, he was the first American violinist to perform in concert in the Soviet Union. Later, he declared that he would not perform there again until artists had more freedom to leave the country. Mister Stern had a strong connection to Israel. He supported young musicians and cultural organizations there. He performed in Israel many times, including during the Persian Gulf War in nineteen ninety-one. Isaac Stern became one of the busiest musicians of his day. He played more than one hundred concerts a year. He also became one of the most recorded musicians in history. This recording is Ludwig van Beethoven’s Romance in F-Major, Opus Fifty. Mister Stern performs with the Franz Liszt Chamber Orchestra. Carnegie Hall in New York City is one of the most famous places for the performance of classical music. All of the world’s best musicians have played there. In nineteen sixty, there were plans to tear down Carnegie Hall and build a tall office building in its place. Mister Stern organized a committee of citizens, politicians and artists to oppose the plan. He successfully led the effort to save Carnegie Hall. Then he became president of the newly established Carnegie Hall Corporation. He held that office for forty years. In recent years, he gave a series of classes for young musicians at Carnegie Hall. Isaac Stern also supported artistic development and freedom. He was an advisor when the National Endowment for the Arts was established. This is the government agency that supports the arts in America. In nineteen seventy-nine, Isaac Stern visited China. He met with Chinese musicians and students. He taught them about classical Western music. His visit was made into a film. It is called “From Mao to Mozart: Isaac Stern in China.” It won an Academy Award for best documentary film. Mister Stern loved to play music by many different composers. He found the works of Wolfgang Amadeus Mozart to be among the most difficult. Here he plays Mozart’s Adagio for Violin and Orchestra with the Franz Liszt Chamber Orchestra. In nineteen eighty-four, Isaac Stern received the Kennedy Center Honors Award for his gifts to American culture through music. He expressed his thoughts about the part that music plays in life. He said he believed that music makes life better for every one, especially children. He said music is an important part of a civilized life. He said people need music as much as they need bread. Mister Stern supported and guided younger classical musicians. They include violinists Itzhak Perlman and Pinchas Zukerman, cellist Yo-Yo Ma, and pianist Yefim Bronfman. Isaac Stern died in two thousand one at the age of eighty-one. He was a major influence on music in the twentieth century. He leaves the world richer with his many recordings. This one is “Humoresque” by Antonin Dvorak performed with the Columbia Symphony Orchestra. This Special English program was written by Shelley Gollust. It was produced by Caty Weaver. I’m Steve Ember. And I’m Sarah Long. Join us again next week for another PEOPLE IN AMERICA program on the Voice of America.